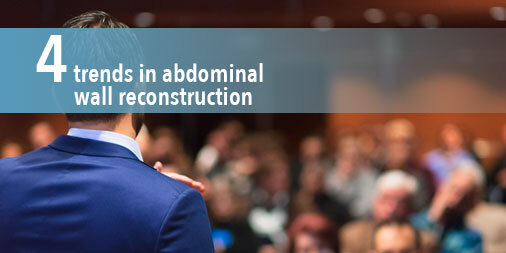 Abdominal wall reconstruction and complex-hernia repairs have advanced rapidly in recent years; it can be hard to keep up. Our own trainers and educators have seen the desire for more knowledge on these procedures. 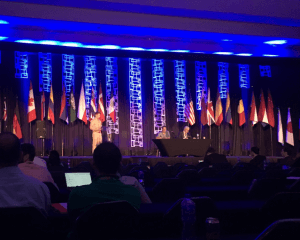 Luckily, this year’s Americas Hernia Society had excellent panels that discussed differing techniques for abdominal wall reconstruction and complex-hernia repair. We made a list of four takeaways. A strong understanding of the disease state, anatomy, and existing dissection techniques may be more important than the mesh. Mesh is still important, but some surgeons used to rely on mesh to do some heavy lifting for the repair. Now, instead of finding the perfect mesh, surgeons are talking about the importance of other elements in the algorithm. Speaker Dr. William Hope shared a quote from Pronovost et al. Data help surgeons make the right decisions and defend those decisions when they’re challenged. In today’s climate, regulatory bodies may question surgeons’ decisions. Tools like the Americas Hernia Society Quality Collaborative (AHSQC) let surgeons collect outcomes data and share those data with peers. “This is what happens when surgeons join together and share data for the greater good,” said Dr. Michael Rosen. In hernia-repair procedures, the goal is to give the patient a definitive repair. In some cases, however, patients have a recurrence and enter, what some call, the vicious cycle of hernia repair. The likelihood of recurrence increases after each repair. Dr. Hope offered a suggestion: perform and document the proper ratio of suture length (SL) to wound length (WL). He shared a quote from Israelsson and Millbourn. Dr. Andrew Strong presents at the Americas Hernia Society. The economic impact of the hernia disease state is under ever-increasing scrutiny. As the number of patients who need treatment increases, so does the cost of treatment. Surgeons need to collaborate to find an economically productive treatment. “We must use a multipronged approach that includes optimized suturing, better repairs, and using preventative treatments,” said Dr. John Fischer. Take a look at our portfolio for ventral hernia repair. 1. Pronovost PJ, Nolan T, Zeger S, et al. How can clinicians measure safety and quality in acute care? Lancet. 2004;363(9414):1061-1067. 2. Israelsson LA, Millbourn D. Prevention of incisional hernias: how to close a midline incision. Surg Clin North Am. 2013;93(5):1027-1040.